Doobons—a breakthrough website and iPhone/iPod/iPad app that utilizes advanced geolocation technology to help patients find the local medical marijuana resources they need—is not a cannabis coupon site. Doobons says that its name similarity to Groupon, the popular daily coupon website, sometimes confuses people, and it is trying to set the record straight. Doobons is not a coupon site. Oftentimes, when I first approach a business about the site, they respond ‘I don’t do coupons. But as soon as I get them on the site, they see how simple and professional it is and want to be a part of it. The Doobons.com website was launched last November and the Doobons iPhone/iPod/iPad app was released last month to help simplify online searches for medical cannabis resources by instantly displaying the resources around users, wherever they are. Those who now use Doobons love the site and app—as evidenced by the 3.5-minute average user time on the site—but some have avoided it, thinking it is a group coupon site, says Doobons. Doobons.com launched its website as a discreet and approachable way for patients of all ages and experience levels with cannabis to find local medical marijuana dispensaries and other resources. The easy-to-use medical marijuana app is already earning rave reviews from users, and has a five-star rating—the highest rating available in iTunes. And the number of downloads are doubling each week. Doobons.com was designed to be convenient and to appeal to everyone, including those who are new to the world of medical cannabis. While most of today’s online medical marijuana directories are designed for patients who already know at least something about using medical marijuana, Doobons.com is designed to be user friendly for patients of all ages and experience levels. Doobons.com is more than just another online medical marijuana directory. It’s the only site of its kind that offers top notch News, Resource and Blog pages that patients and caregivers can really use. For more information about Doobons.com, call (415) 524-8099 or go to http://www.Doobons.com online. The best way to stay informed about developments about Doobons.com is to like them on Facebook at http://www.facebook.com/pages/DOOBONSCOM/211376972233726 and follow them on Twitter at http://twitter.com/#!/doobons. Doobons.com is an online medical marijuana resource for prospective and current patients, caregivers and medicinal cannabis industry professionals. The medical cannabis resource site is designed be a comprehensive source of information for everyone from novice medical cannabis users to experienced industry professionals. Doobons.com is discreet, safe and professional. 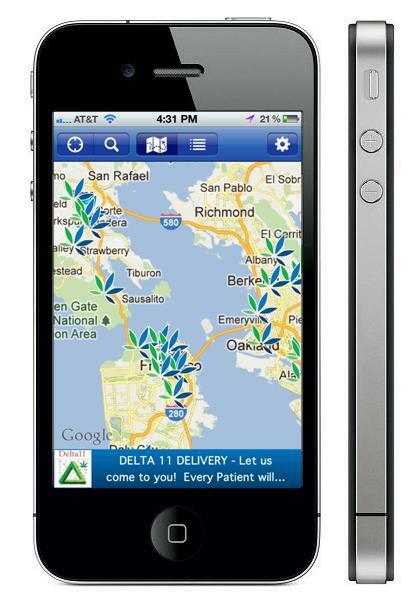 The Doobons app uses geolocation to instantly display local medical marijuana resources near the user.